Currently, the common name of red fish are fish such groups as the sturgeon and salmon. The most popular of these include salmon, trout, salmon, KETA. Of these fish are obtained the most delicious dishes and delicacies, and even, if they just pickle. Red fish is not only one of the most delicious fish products, but also a treasure trove of healthy cells, such as phosphorus, iodine, zinc, calcium, which is useful only intensified after salting. The easiest way, of course, buy ready-salted fish at the store, but it goes no less delicious home-cooked, yes and also gets the opportunity to save as much of its beneficial properties. Therefore, it's worth to try to pickle red fish alone. For salting use only the best fresh fish or, in a pinch, fresh frozen. If the fish still need to unfreeze, then in any case it can not be put under water, it should be thawed slowly without external influences. Carve fish is best to start with the removal of the head and fins. Then made an incision in the abdominal part along the torso and completely removed all its innards. From bones to get rid of the easiest follows. We make an incision on both sides of the ridge, then gently separating it from the carcass and as the fresh fish, something with it begin to be removed virtually all of its remaining bones. The remaining bone can be removed with tweezers. For salting should not take the metal container, it is better, if it is plastic or enameled ware. If you purchased the pink salmon or chum salmon, should pay attention to what, that their meat is more dry than, if it was a salmon, trout or red salmon. Therefore, before salting their best to smear a little olive oil. The salt used for salting large, because it is better able to absorb the excess moisture. must be prepared for salting on 1 kg of fish, 90 g salt, 6 peas of black pepper, a couple of bay leaves, 30 g 9% vinegar, 1 onion head, 50 ml sunflower oil. After that, clean the fish from the inside, peel and seeds and cut into fillets obtained on large pieces and put them into a deep container. Then prepare a solution of, mix for which half a liter of cold water with salt. Pour the prepared solution in a container with the fish on top and put something heavy as oppression. Under the yoke of a fish should stand for about half an hour. After the fish protomai, merge it with water and preparing a marinade, to which was mixed in a glass of water Vinegar. Then the fish poured with the marinade and leave to infuse for quarter of an hour. While the fish is marinated, can be prepared onion, chop it into thin rings or half rings. After that, Currently, as the fish, merge it with the excess fluid, we give obtech. Add to it prepared onions, sunflower oil, peas and bay leaf and all the ingredients are thoroughly mixed. Through 20 minutes, the fish can be laid out on a dish and serve. Burke fish, but not peeled. Then divide it into two halves. Mix the salt and sugar and mix thoroughly, rub on all sides of each of pieces of loins. Fold the halves together, between them lay the laurel leaves, you can add a slice of lemon, and then sprinkle barrels trained coriander seeds and black pepper peas. Take a cotton towel, decompose it on the table and evenly scatter salt on it. Put the prepared fish pieces on the fabric and wrap them tightly in her. Wrapped in a tissue wrap fish again in paper towels and placed in a suitable pan and put in the refrigerator. The fish will be ready for use by 3 day, during which the need to periodically replace the paper towels on fresh, and fish, wrapped in a cloth to reveal, flip on the other flank and then wrap. The first recipe we can safely use, If guests are practically on the doorstep, you have in your arsenal of red fish, and you want, so it was definitely on your desk, Well, the second approach housewives who have more time, and who wants to result in a product saltier. All kinds of red fish in its tasty, yet each of them has its own characteristics, so there are many recipes, how to pickle each of them individually. 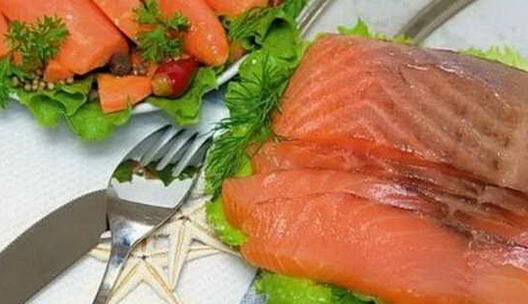 One of the most tender and tasty meat is considered trout. Therefore, after salting it turns out very delicious and palatable. Salt trout can be supplemented with various condiments, so she gets even more spicy and interesting. We offer you some pretty simple recipes. mix 60 grams salt and 30 grams of sugar. One large lemon cut into thin slices. Take a gauze cloth and lay it on the table. Clear the carcass trout from the bones, skin and viscera and carefully rubbing it like on the inside, and on the outside, a prepared mixture of sugar and salt, trying not to leave any area not to miss the mark, then put it into a couple of lemon slices. on the surface, spread on the gauze table, spread one to one slice of lemon. The next layer put salted fish and podsaharennyh. Then again decompose the remaining lemon slices. After the procedure done fish wrap with gauze and spread it into the prepared container. Capacity is removed to a cool, inaccessible to light the place for a couple of days. After the necessary time we pull out the fish, unwrap and purify with a fork or spoon of lemon and excess salt and sugar mixture and cut into portions. After which the fish to be served. 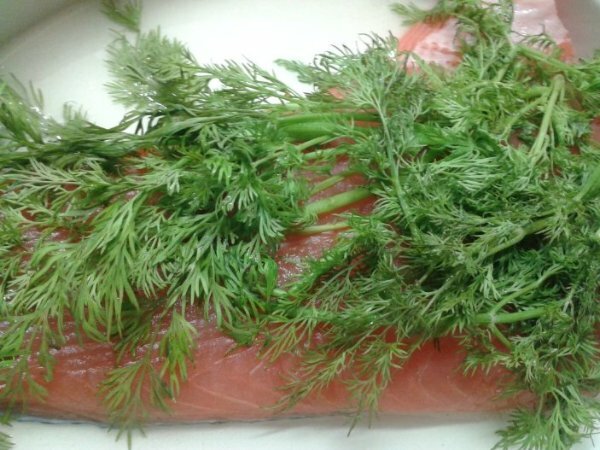 On 1 kg of trout we need 180 g sahara, 1 big bunch of fresh dill, 5-6 tablespoons of salt. We clean the fish and divide it in half. Making a mixture of sugar and salt and rub it fillet trout. Pre-washed with cool running water and thoroughly dried dill is divided into three parts. The first part put on the bottom of a deep and wide bowls. Then decompose in the fennel one of the halves of the carcasses trout. Cover with another layer of the fish of the second part of dill. 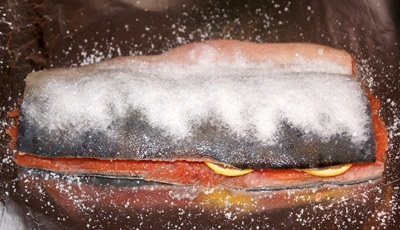 Then lay on top of the remaining half of the trout and then the top cover with its dill. Then cover with fish flat cover, or a plate, size slightly smaller, than the actual bowl. Pour into a three-liter jar cool water, We close the lid and put pressure on the prepared cover. Under such oppression fish should stay about 8 hours at room temperature. Then trout rearranged in a cool place, eg, in the fridge. Two days later a delicacy ready. Like trout, Salmon has a very tender meat, and another advantage is its large fish carcasses. Since this fish is quite expensive product, after its processing, its price is very significantly increased. Therefore, much more profitable, Yes, and tasty salted salmon at home, especially since the recipe how to do it big set. 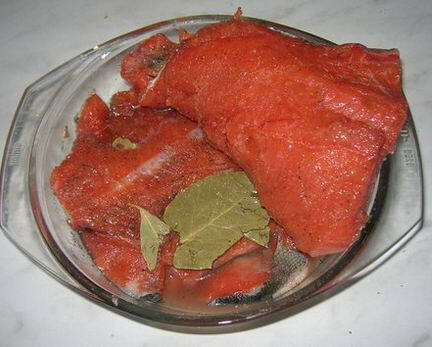 One kilogram stoned, viscera and skin salmon, cut into thin slices. Put the pieces of fish in a cup, add to them 50 g of salt and mix thoroughly all, trying to rub salt into the salmon slices. Pour into a bowl 175 g sunflower oil and mix all again. Then spread pieces of salmon in a clean sterile glass or plastic container,, cover with a lid and put it in the refrigerator. Approximately ten hours, the product is ready for use. When a table, if desired, Salmon can sprinkle with vinegar, to podzharit and add to taste black pepper. 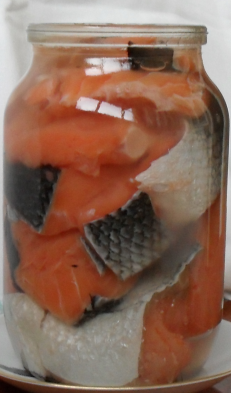 To pickle salmon this way, we need 1-1,5 cups tomato or cucumber pickle, special seasoning for fish and salt to taste. Part of purified salmon and sliced ​​fillets spread on the bottom of the container and cooked sprinkle it over the mixture of salt and seasonings. Then, in the same way we are stacked in layers and prosalivaem remaining fish fillets. After that, as the last layer to be decomposed, fill with fish tomato or cucumber pickle. Dish with fish is put in the refrigerator and through 24 hour, the product is ready for use. Peeled and sliced ​​thin slices of fish put in a deep bowl and mix it with salt and pepper, amounts of these ingredients, take in its sole discretion, based on your taste. Subject to infuse for one hour, after which the product is ready for serving. Pickled salmon so great, as a constituent component for salad. Meat chum many nutritionists belongs to the category of dietary and healthy nutrition, and if this pickle red fish, it becomes possible to maintain its useful properties much longer. Salted chum simply, the most difficult in this considered only its purification. Prepare for salting fish, clearing it from the bones and viscera. We divide it into several large pieces. mix 250 g salt, 175 g sahara, ground black pepper to taste, a pair of leafs chopped leaves in a deep plate. Then each piece of chum put in a bowl and sprinkle it properly obtained mixture, alternately turning on different sides. Then, boneless fish we add in a cup, tight-fitting lid and place in the refrigerator for a day. Through 24 hours take out the fish from the cup, and every piece of it was wrapped in a plastic bag. Then remove all the bags of fish in the freezer, which keep the fish three days. Mix sugar, and salt in a proportion of 1 to 3. We coat the fish with olive oil. On 1 kg of purified salmon take 90 g of the resulting mixture and its fall asleep, trying to distribute evenly, inside the carcass. Put the fish in a suitable pan and sprinkle with pepper and crushed bay leaf and put a fish bowl. Then the plate put on a three-liter jar with water or any other suitable load. Leave to stand at room temperature for about two hours, and then move to the refrigerator. Thus pickle red fish and enjoy it as a finished product will be only one day. 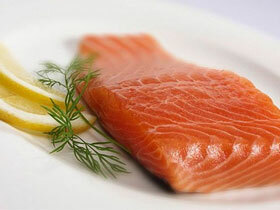 Pink salmon is one of the most accessible and affordable varieties of red fish. Its only disadvantage is that, that she is a little dryish, but this is easily remedied, previously missed its carcass oil. 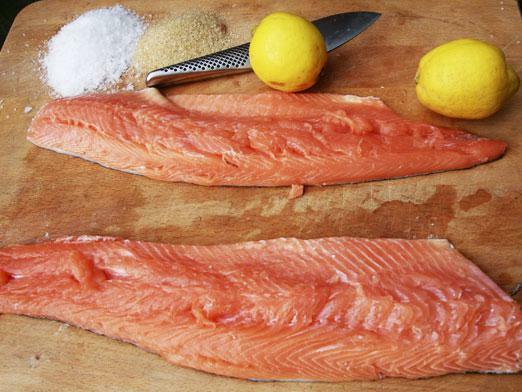 salted salmon, like any other red fish can be a variety of options, look at a couple of them. Once the fish cleaned and sliced, We proceed to the preparation of brine. To this is poured into the water pan and bring to a boil, then remove it from the plate, add salt to taste and stir. Is removed, the solution was cooled, and the fish are placed in small jars. Then pour the marinade cool fish, so that it was completely covered with them and leave the stand for about an hour, after which to the banks should be placed in the refrigerator. Fish in brine should insist in a cool place for about two days, whereupon the product is ready for use. To pickle red fish pink salmon with mustard following ingredients are required: 90 g salt, 15 g granulated sugar, 1 litere of water,2 bay leaf,5 peas of black pepper, 30 Mr. mustard, 3-4 pea allspice. Pour into water in a small pot and attach thereto salt, bay leaves, pea and fragrant black pepper and sugar and stir. After that, put the pan on the fire and boil for about a quarter of an hour. Ready mix the marinade with mustard and quenched. Refined fillets cut into small pieces and put them in a container for salting. Add the marinade for fish, filling them to the brim capacity. 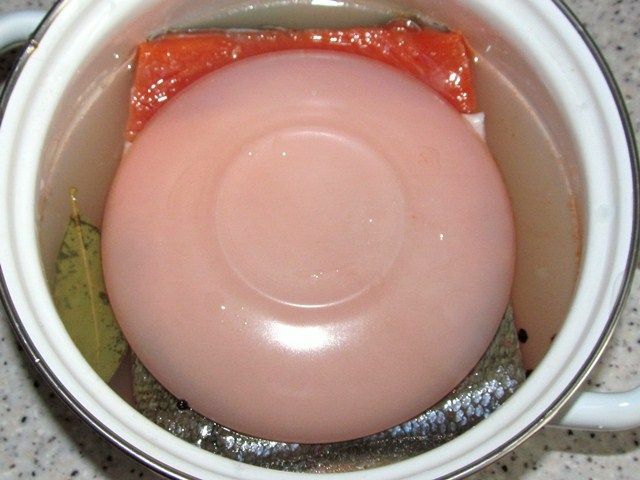 Put a pink salmon in a cool place, and three hours later salting it can bring to the table. 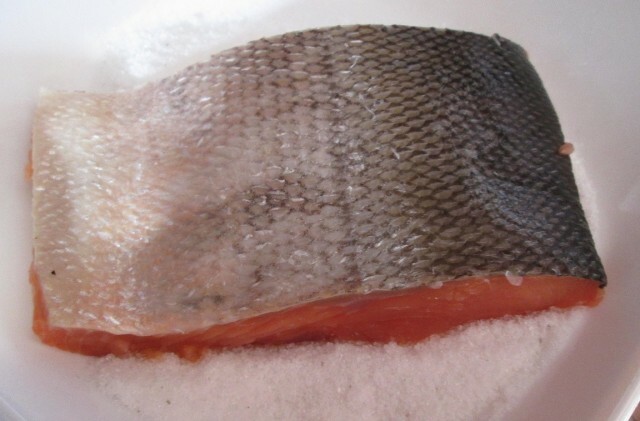 Benefits of home salting great multitude in the first place is the ability to cook salmon on its own taste: lightly salted or salted by soul, with or without seasoning them, and do it, As you can see is not difficult.